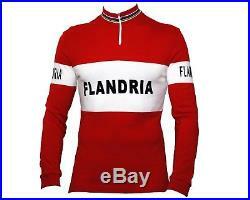 FLANDRIA Retro Wool Cycling Jersey Short/Long Sleeve – Genuine Flandria Product. You asked for it – we made it for you! 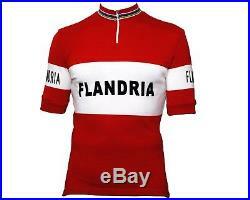 We re-issued the classic Flandria knitted jersey as worn by the Flandria Heroes in the 1960′s and 1970. Available in a choice of either Short Sleeve or Long Sleeve. 50% wool / 50% acrylic blend. Black Flock, 1970′s style lettering. Knitted arm cuffs and collar. World Champion bands around collar in memory of J. 3 traditional rear pockets. Wash dark colours separately. Do not dry clean. Do not tumble dry. Cool iron: 1 dot, inside out. Do not iron lettering. Armpit to Armpit (cm). Small – 42cm / 16.5. Medium – 45cm / 17.5. Large – 47cm / 18.5. XL – 49cm / 19.5. XXL – 53cm / 21. XXXL – 56cm / 22. We also make personalised bike frame name decals for Professional Cyling teams and the public – So everyone can look like a Pro! _gsrx_vers_811 GS 7.0.9 (811). 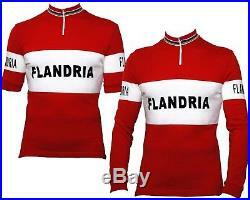 The item “FLANDRIA Retro Wool Cycling Jersey Short/Long Sleeve Genuine Flandria Product” is in sale since Friday, January 12, 2018. This item is in the category “Sporting Goods\Cycling\Cycling Clothing\Jerseys”. The seller is “***flandria***” and is located in Preston. This item can be shipped worldwide. This entry was posted on Thursday, April 12th, 2018 at 9:35 am	and is filed under flandria. You can follow any responses to this entry through the RSS 2.0 feed. Both comments and pings are currently closed.